Officials said the flag represents the area's people, culture and history. METAIRIE, La. -- I pledge allegiance to the flag of ... Metairie? You read that right. Members of the Jefferson Chamber unveiled the flag Wednesday as part of New Orleans' Tricentennial celebration. Originally part of New Orleans, Metairie is now its own distinct community with about 150,000 residents, officials said. "The most notable attributes of the flag are its three golden fleurs and coeurs de lis (flowers and hearts of the lily) balanced in a coupling of trinity arrangements, respectively representing tradition, wisdom, prosperity, opportunity, faith, and innovation," the organization said. "The red and blue foundation and aspirational thin, white stripe signify the principles of natural liberty and equal justice guiding a limited, transparent government." The flag was developed through an 18-month process with the Jefferson Chamber Young Professionals that involved research, design and selection of the final flag. 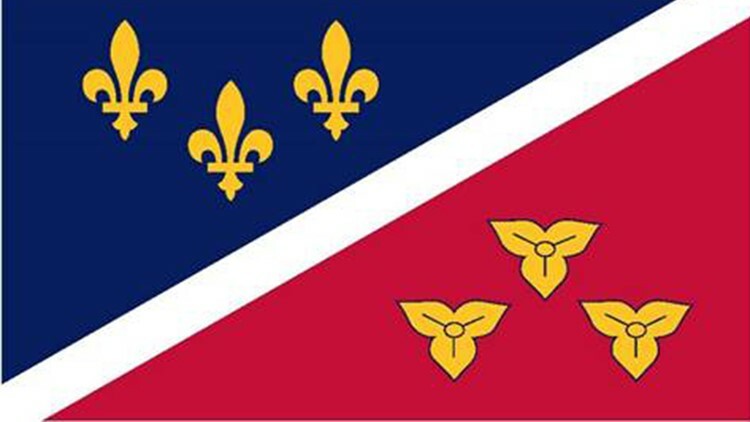 The first official raising of the Metairie flag will take place Nov. 1. Click here to find out more information about the flag.